Angus McGregor Movies: My Top 10 Films of 2017! So 2017 has come and gone, so everybody is rushing to put out their best and worst of the year lists. I know you've probably seen dozens of these already, but why not look at yet another? 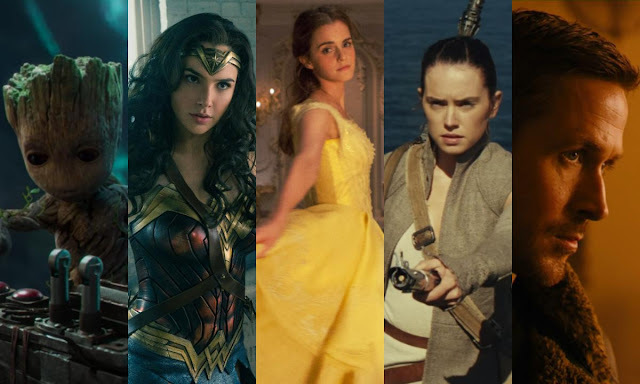 With that, here are my 10 favourite films of 2017, enjoy! So now that's out of the way, let's jump into number 10! At number 10 is the first of two Netflix films on my list and is what I believe to be the best Stephen King adaptation of the year, Gerald's Game. 2017 was a pretty good year for the horror/thriller genre, with films such as Get Out and Split being fantastic in their own right. Yet, it was this that really got under my skin, with its simple plot that is handled magnificently by director Mike Flanagan. Carla Gugino puts in one of the best performances of the year -whilst mainly handcuffed to a bed - in a story that creates a terrifying situation but also is a fantastic character study. The film gets really dark at times and is very unsettling, especially when we explore Gugino's characters past. For fans of horror, definitely give Gerald's Game a watch. 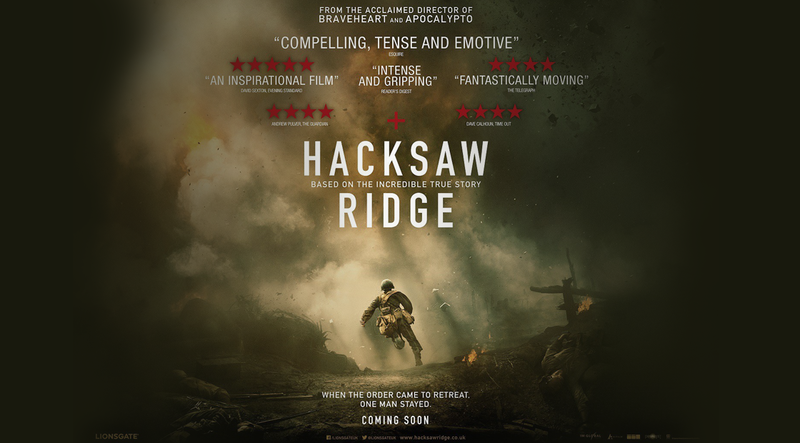 Coming in at number nine is an early U.K. release that did very well during award season in 2017, Hacksaw Ridge. Mel Gibson's return to the director's chair was a very successful one, as Hacksaw was one of the years most powerful and finely crafted films. The film focuses on an unlikely war hero and focuses on his determination to save lives rather than take them. The action scenes are incredibly realistic, creating many brutal moments, but Hacksaw is a true testament to the human spirit and retells this miraculous story wonderfully. Andrew Garfield was fantastic as the stuttering Desmond Doss in a film that gets great performances from Vince Vaughn and Sam Worthington. 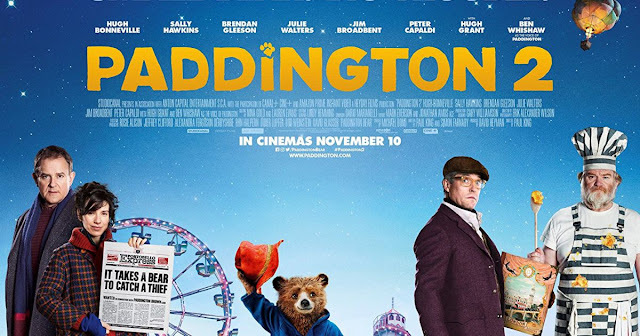 Paddington 2 is by far the most surprising film of the year for me and is one of the best times I've ever had at a cinema! This film is pure fun and it really caught me off guard. I expected a fairly enjoyable film that would satisfy me for just under 2 hours. However, the film exceeded all expectations, with a great story filled with fun, interesting characters and silly antics making this one of the most purely enjoyable family films of recent times. This already impressive British cast was improved with the additions of Hugh Grant and Brenden Gleeson, who are fantastic in their newly acquired roles, whilst the returning Ben Whishaw and Sally Hawkins are ever so delightful yet again. A complete joy that will have you laughing, tearing up, gazing in awe and on the edge of your seat, Paddington 2 is a very worthy addition to this list. The second Netflix film to make my list is Bong Joon-ho's Okja, an extremely emotional story that really caught me off guard. The first half of the film explores the relationship between young child Mija and this super pig Okja, as we create an emotional bond with the two. The second half is much darker as it explores celebrity depiction, animal cruelty and greedy conglomerates which mirrors the real world oh so closely. This film features an impressive cast of stars who all bring it as very conflicted characters which is something I really appreciated with the film. The characters whether good or bad are not all morally perfect - with the exception of Mija and Okja - and creates for some interesting dynamics and only showcases the innocence of the two main characters furthermore. With such sensitive subject matter like animal cruelty, there are some very emotional moments, none more so than in the finale. The film is a Netflix original and is the kind of film that needs support in order for Netflix to continue making strides with their original films. Edgar Wright is one of my favourite filmmakers and has created some of the best genre-blending films, with hits like Hot Fuzz and Shaun of the Dead. Due to this, I was eagerly anticipating his latest film Baby Driver ever since it was announced. It isn't my favourite film from Wright but that is no discredit to the film as this is one of the best-crafted action films of recent years. The use of real stunt drivers, choreography and music create some of the most enjoyable action scenes of the year in a film that was oozing of originality. The ensemble cast works perfectly well with each other, creating an interesting dynamic which kept you guessing which way the story will go. Wright has yet another success under his name and continues to showcase his abilities as one of Hollywood's best and most creative directors. 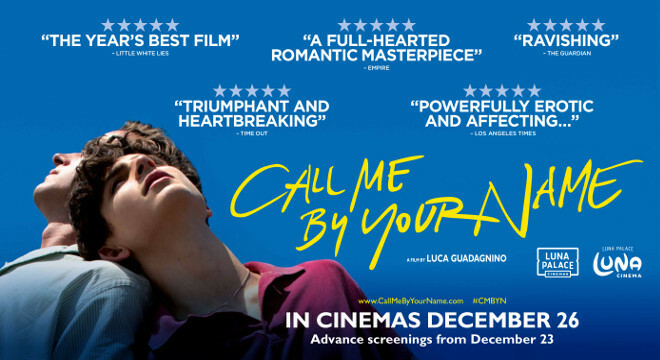 Cracking into the top 5 is Call Me By Your Name, which I feel has the best male performance of the year from Timothee Chalamet. This gay-romance film is both beautiful and heartbreaking as the story follows a young Italian boys first ventures into love. Despite the nature of this relationship, the story is universal and there are things that everybody can relate to and even see reflections of themselves in. This makes the film even more powerful and emotional for the viewer, which is backed up furthermore by fantastic performances and soundtrack. There are two scenes in particular that will stick with me for a very long time due to their powerful effect, including the end credits where Chalamet showcases his talents. The way he conveys his emotions without saying a single word is arguably the best piece of acting this year and is a fantastic ending to a great film. At number 4 is perhaps the most unique film of the year and certainly of this list, Raw. This French/Belgian coming of age, horror film really surprised me with just how good it was, as it follows a young woman's first experience at veterinarian school. With this, she faces many urges but not all that would be expected in a coming of age film. The film actually uses cannibalism to explore temptations, rivalry, sexuality and many others in this environment which leads to some very startling and incredibly grotesque moments. Garance Marillier is fantastic in the lead role as we slowly see her character Justine descend from a top student into a flesh-hungry, jealous nightmare. This was a very challenging performance which Marillier excels fantastically well in Julia Ducournau's feature film debut as a director. As both a fan of coming of age and horror films, this was a perfect blend for my tastes and one that I won't forget anytime soon. Manchester By The Sea may just be the most realistic film of 2017 and it uses that authenticity to power its often bleak and emotional story. The film follows Casey Affleck - who gives the performance of his career - and how he struggles to deal with past and present traumas and problems. As the film goes on, we get more information about this deeply troubled character, and with each addition of information, there is a powerful punch behind it. Kenneth Lonergan's script is near flawless as the film is never ever dull and constantly has you hooked, despite it being miserable a lot of the time. It must be said, though, that the film does have some great humour within the film to stop it from being all doom and gloom. This is a film that could turn people the wrong way but I loved every moment of this film and was hungry for more once the credits started to roll. At number 2 is Christopher Nolan's war epic Dunkirk. 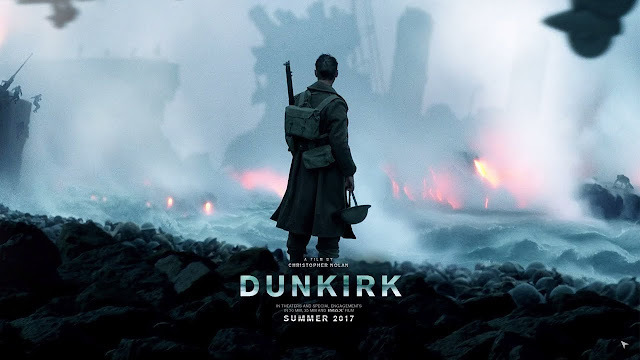 Dunkirk certainly won't go down as one of the best character-driven movies but certainly will in terms of a cinematic experience like no other. This film is completely immersive with flawless sound design, cinematography and practical effects that help create an ever so realistic setting. An impressive cast featuring the likes of Mark Rylance, Tom Hardy and even Harry Styles provide rooted performances, filled with emotion, fear and struggle at every moment whilst stuck in this situation. The narrative structure itself is very unique and was a great way for Nolan to explore different aspects of this event, with linking them up simultaneously. For me, this is up there with Nolan's best work and one that I'll be rewatching soon in 2018. At number 1 and way ahead of everything for me is La La Land. By comparison, nothing ever came close to overtaking La La Land as my favourite film as I was completely swept away by this film. The music, choreography, performances, cinematography, costume, set design, everything was just perfect. This is now one of my favourite films of all time as I loved every moment of this film. I was humming the soundtrack for days and think about it constantly as it is a truly magical film. This happens to be the film I've seen the most at the cinema as I could not get enough of this movie earlier this year. Ever time I talk about it, it just makes me want to watch it yet again. The film has resonated so deeply with me unlike any other this year which makes La La Land, undoubtedly, my favourite film of 2017! So that concludes my top 10 list of films released in 2017! I hope that everyone had a great year and hope for all the best in 2018! Let me know what your favourite films of the year were and also what you're looking forward to seeing this year. Also, keep your eyes out for my top 10 worst films of the year which will be a lot harsher list! Until then, thank you for taking the time to read my blog, it is much appreciated!